If you’re dieting, chances are you’re hungry! You know skipping breakfast or drinking that diet shake just isn’t going to cut it. When diets leave you hungry, you can find yourself off-course and giving into dreaded and seemingly inevitable cravings. How many times have you started a diet with a bang, but one indulgent moment and the whole thing caves in. Those indulgent moments happen when we're hungry, unsatisfied. I'm not a big dieter, but I have before and have experienced some of my most indulgent moments while dieting. If I would have known about how Fiber One Original cereal can help stop hunger from taking diets off-course, maybe I would have had better luck. Fiber helps satisfy your hunger so it’s easier to eat less and lose weight without feeling as hungry. *One serving of Fiber One Original cereal provides more than half (57%) of the Daily Value of fiber. *Fiber One Original cereal is a tasty way to start your morning on the right track with 0 grams of sugar, 14 grams of fiber, 60 calories and 1 gram of fat per serving. For more information or additional tips, please visit http://www.fiberone.com/. I have found that if I start my day with a bowl of Fiber One and some fruit or a yogurt, that I can make it until dinner without being hungry. Fiber One does contain gluten, and while I am not strictly gluten free, I am conscious of how much I consume. 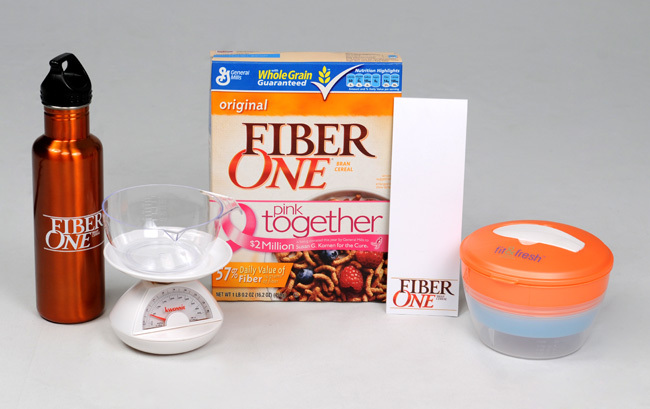 One winner will receive a Fiber One Original Prize Pack that includes Fiber One Original cereal, a cereal-on-the-go container, food scale, water bottle and notepad for tracking what you eat. *Follow me @jamaise at Twitter & Tweet this : RT @jamaise #GIVEAWAY #WIN - A Fiber One Original Prize Pack- Everyone gets a coupon!! #myblogspark http://bit.ly/bfmumA ends11/10 tweet each day for one entry each ! Disclaimer: Fiber One provided me with all information and product to review through My Blog Spark. I was under no obligation to review it if I so chose. Nor was I under any obligation to write a positive review or sponsor a product giveaway in return for the free product. These views are my own. I avoid diet missteps by not buying junk food. If I don't have it, I can't eat it! I'm a fan of Fiber One on FB. I make too much food, it is hard to do portion control, when there is so much of it. My biggest misstep is the afternoon snack. If I don't have anything healthy to eat handy, I'll eat whatever I find (usually chocolate)! I avoid missteps in my diet plan, by not having junk food in the house to begin with-I also DO splurge, but in moderation(huge sweets lover haha)! I entered your Wanchai Ferry / Macaroni Grill GIVEAWAY! Grabing a snake cake when in a rush is my downfall. I have a tendency to snack way to much and not on healthy things. I also finish my kids food! So bad! I avoid diet missteps by packing tons of healthy snacks. I also avoid buying foods that will cause a diet misstep! I don't usually even try fad diets but I had tried the Cabbage Soup Diet. Besides being starving all day I was 'stinky' too. The only thing I lost was friends from all the gas I had. LOL. I follow your blog and one of my dieting missteps is drinking too much soda. Thanks. I drink too much pop, and need to at least try to cut down! Years ago, I stopped drinking it cold turkey and lost 5 lbs. almost immediatly!